Harrisburg, PA – Governor Tom Wolf today announced the creation of a “Ready to Start” task force focused on informing the strategy to address health, human services, and education policy for infants and toddlers ages zero to three. 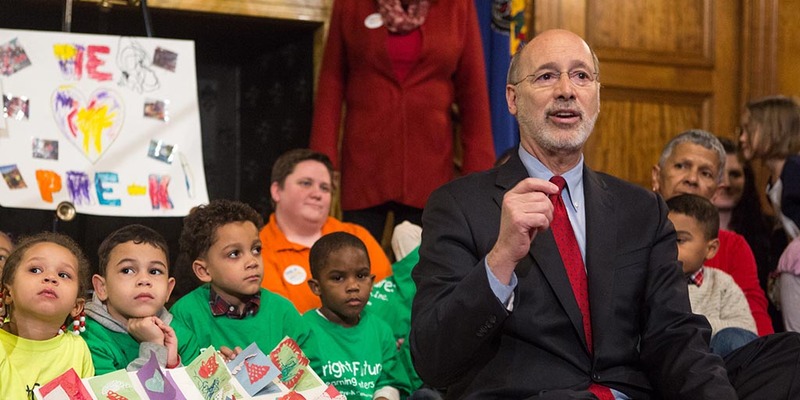 “The Ready to Start Task Force complements my administration’s robust agenda for all children, which includes access to high-quality pre-K through 12 education and access to health and human services programs and supports,” Governor Wolf said. “Ready to Start rounds out this agenda with a focus on our youngest Pennsylvanians. Following the creation and successful outcomes of Gov. Wolf’s Middle Class and School Safety task forces, which used a similar approach to engagement through regional listening sessions, the Ready to Start Task Force will host six sessions across Pennsylvania in October and November. The intention of the listening sessions led by professionals with a focus on early learning and child development is to gather information and insight and to look at current and possible strategies to help the youngest Pennsylvanians. The governor appointed six co-chairs to lead the Ready to Start Task Force: Janet Haas, M.D., Chair of the William Penn Foundation Board of Directors, representing philanthropic and business entities; Jodi Askins, Director of PennAEYC, representing advocates and providers; David Rubin, MD, MSCE, Director of Population Health Innovation and PolicyLab at Children’s Hospital of Philadelphia, representing health and research; Maureen Cronin, Executive Director of The Arc of Pennsylvania, representing children with disabilities and their families; Dr. Valerie Kinloch, Dean of the University of Pittsburgh School of Education, representing child development and education; and Nyanda Finley De Santos, parent and Director of Family and Community Engagement at Community Services for Children’s Head Start Program, representing parents and community partners. Representing the Wolf Administration on the commission are Secretary of Human Services Teresa Miller, Secretary of Health Dr. Rachel Levine, Deputy Secretary of the Office of Child Development and Early Learning Suzann Morris, and Deputy Secretary for Health Promotion and Disease Prevention Dr. Loren Robinson. The Ready to Start Task Force builds on the significant progress that has been made under Governor Wolf’s leadership to advance education, health care, and human services programs that support Pennsylvania’s children, families, and communities. This year, 15,000 children will receive home-visiting services and other evidence-based supports through Pennsylvania’s Community-Based Family Centers and Nurse-Family Partnership programs. Gov. Wolf’s 2018-19 budget included a $5.3 million increase for community-based family centers, including $4.5 million to provide home-visiting services for families affected by opioid use disorder, along with increased funding for home-visiting providers and Nurse-Family Partnership programs. These programs have a family-centered focus and strength-based approach that works with both the child and parent beginning as early as when a new baby is brought home from the hospital. Studies of various home-visiting programs have shown positive impacts on children’s cognitive development and behavior, higher grade point averages and achievement scores at age 9, and higher graduation rates from high school. Research shows that supporting the well-being of children through nutrition and health care supports, positive caregiver relationships, and high-quality early learning opportunities in the first three years of life sets them up for lifelong success. And children who receive high-quality early learning and care perform better in school, graduate at higher rates, and earn more throughout their lives compared to their peers. Governor Wolf’s support and promotion of the Children’s Health Insurance Program (CHIP) helped increase enrollment to provide this vital service to more than 180,000 children in Pennsylvania. The program provides health insurance to uninsured children and teens up to age 19 who are not eligible for or enrolled in Medicaid. CHIP is available for families whose income is above 133 percent of the poverty level. Over the course of his tenure, the Governor has worked with the General Assembly to increase investments in public education at all levels by $1 billion, from early childhood to K-12 to postsecondary – including expanding state-funded preschool programs by $115 million. These investments and efforts have yielded significant outcomes for Pennsylvania’s children and families, including increasing the number of children able to attend pre-kindergarten by 60 percent, adding more than 9,600 slots in Pre-K Counts and an additional 1,300 in the Head Start Supplemental Assistance Program (HSSAP). Increased funding in the 2018-19 budget for early intervention (birth to age 3) will help serve 39,930 infants and toddlers and their families/caregivers across Pennsylvania. The 2018-19 budget also included $6.8 million in increased funds for child care services paired with $50 million in federal funding to serve 1,100 children on the child care waiting list. In August 2017, Pennsylvania revamped its Keystone STARS child care rating system designed to improve quality in child care and early learning offerings. The governor’s 2018-19 budget included $5 million for professional development for early care and education professionals and $2 million to pilot contracting with STAR 3 and STAR 4 programs in Pennsylvania’s Pre-K Counts program to serve infants and toddlers, improving access to and continued enrollment in high-quality early learning settings by weighting subsidies that help low-income families pay for child care toward higher-rated child care offerings. The Ready to Start Task Force will share findings and options with the governor in January 2019, including a review of existing programs and initiatives.